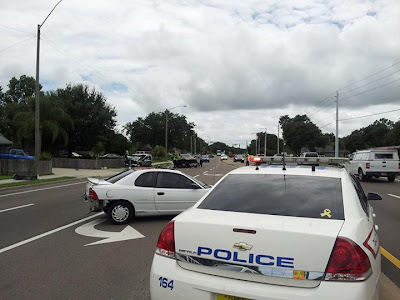 PALM BAY, Florida -- Five people were hospitalized Thursday afternoon following a three-vehicle crash on Babcock Street near Fallon Boulevard in Palm Bay, Florida. When Palm Bay patrol officers and fire-rescue personnel arrived on scene, they located and treated the victims - two of which were ejected from one of the vehicles. Palm Bay City spokesperson Yvonne Martinez said in a release that the crash investigation revealed the driver of a maroon-colored Ford F-150, occupied by 27-year-old Kristopher Moffitt and 26-year-old Mallory Friends, lost control in the area of Omega Street while the truck was traveling southbound on Babcock Street. The truck veered off to the right and the driver appeared to over-correct and ended up crossing the median into oncoming traffic in the northbound lanes. Investigators have not yet determined who was driving the F-150. The truck hit a northbound Dodge Neon in the left rear and then hit a Chevy Silverado head-on. The driver of the Silverado, 61-year-old Donald Leinthall, had to be extricated from the vehicle. He was hospitalized with serious, non-life threatening injuries. His brother, 57-year-old William Leinthall, was in the vehicle with him and also suffered serious, non-life threatening injuries. Moffitt is listed in critical condition at the hospital. Friends is hospitalized with serious, non-life threatening injuries. 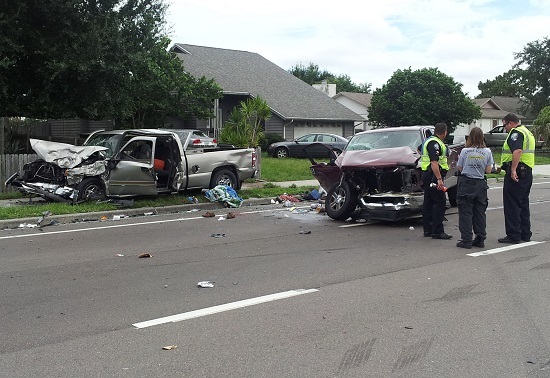 The driver of the Dodge Neon, 20-year-old Marchina Walker, was treated for minor injuries.